Drive: The Peopleware of this Generation? The 70’s and 80’s had The Mythical Man-Month. The 90’s had Peopleware. These works helped software managers understand and communicate to non-software people the dynamics involved in effectively managing software teams. The management models that got cars and TVs built at ever cheaper costs didn’t work on software projects. Brooks, Lister, and DeMarco helped thoughtful software managers figure out how to best manage professionals who must bring a challenging combination of creativity and technical rigor to their work. 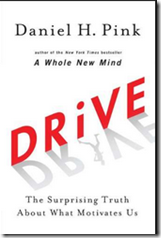 In Drive: The Surprising Truth About What Motivates Us, Dan Pink provides the same kind or resource for a more general audience. He argues that the models for understanding human motivation that worked in the past are outdated and don’t apply to today’s knowledge workers. Pink contrasts internal and external motivation. Our internal motivation is driven by three needs: autonomy, mastery, and purpose. Mastery: We are driven to grow, improve, and be increasingly capable of solving more and more complex problems. Mastery is a mindset: It requires the capacity to see your abilities not as finite, but as infinitely improvable. Internally motivated people tend to have an incremental theory of intelligence, prize learning goals over performance goals, and welcome effort as a way to improve at something that matters. Mastery is pain: It demands effort, grit and deliberate practice. The path to mastery – becoming ever better at something you care about – is a difficult process over a long period of time. Mastery is asymptotic: It’s impossible to fully realize, which makes it simultaneously frustrating and alluring. Purpose: The old models for understanding motivation assumed that we are primarily motivated by money. Today we see money as a necessary but not sufficient reward of our work. We want to know that what we do makes a difference in the world. Much of Drive is derivative of the research done in cognitive psychology and behavioral economics, but Pink brings it all together in an engaging and practical way that will allow managers to put these ideas into action. I highly recommend it to anyone who oversees the work of anyone else. For a small taste of the ideas in the book, check out this presentation. This entry was posted in Management and tagged Dan Pink, Drive, management by efarr. Bookmark the permalink.